Prokaryotic cells do not have a true nucleus that contains their genetic material as eukaryotic cells do. Instead, prokaryotic cells have a nucleoid region, which is an irregularly-shaped region that contains the cell’s DNA and is not surrounded by a nuclear envelope. Some other parts of prokaryotic cells are similar to those in eukaryotic cells, such as a cell wall surrounding the cell (which is also found in plant cells, although it has a different composition). Like eukaryotic cells, prokaryotic cells have cytoplasm, a gel-like substance that makes up the “filling” of the cell, and a cytoskeleton that holds components of the cell in place. Both prokaryotic cells and eukaryotic cells have ribosomes, which are organelles that produce proteins, and vacuoles, small spaces in cells that store nutrients and help eliminate waste. 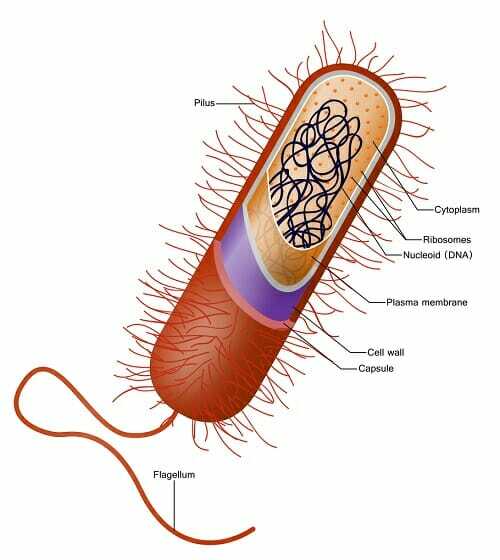 Some prokaryotic cells have flagella, which are tail-like structures that enable the organism to move around. They may also have pili, small hair-like structures that help bacteria adhere to surfaces and can allow DNA to be transferred between two prokaryotic cells in a process known as conjugation. Another part that is found in some bacteria is the capsule. The capsule is a sticky layer of carbohydrates that helps the bacterium adhere to surfaces in its surroundings. The following image is a diagram of a prokaryotic cell; in this case, a bacterium. All prokaryotic cells have a nucleoid region, DNA and RNA as their genetic material, ribosomes that make proteins, and cytoplasm that contains a cytoskeleton, which organizes and supports the parts of the cell. Prokaryotic cells are simpler than eukaryotic cells, and an organism that is a prokaryote is unicellular; it is made up of only one prokaryotic cell. Prokaryotic cells are usually between 0.1 to 5 micrometers in length (.00001 to .0005 cm). Eukaryotic cells are generally much larger, between 10 and 100 micrometers. Prokaryotic cells have a higher surface-area-to-volume ratio because they are smaller, which makes them able to obtain a larger amount of nutrients via their plasma membrane. Like bacteria, archaea can have a cell wall and flagella. However, the structure of these organelles is different. For example, archaeal cell walls do not contain peptidoglycan. In addition, the flagella of archaea work the same way as those of bacteria, but they evolved from different structures. Membranes of archaea are very different than those of all other lifeforms; they contain different lipids, which have a different stereochemistry. Archaea usually have one circular chromosome, like bacteria do. The archaeal chromosome can range from less than 491,000 bp to about 5,700,000 bp. They can also contain plasmids. Less is known about archaea than bacteria; they were not classified as a separate group of prokaryotes until 1977. Eukaryotic cell – A cell that has a true nucleus surrounded by a nuclear envelope, and contains organelles such as mitochondria. Prokaryote – An organism that has prokaryotic cells; this includes the domains Bacteria and Archaea. Microorganism – A living thing that is microscopic. Nucleoid – A region in prokaryotes that contains the cell’s DNA; it is not a true nucleus because it does not have a nuclear envelope. 1. Which organism is made up of prokaryotic cells? B is correct. An archaeon is a prokaryote. Archaea and Bacteria are the two domains of life that are prokaryotic; all other lifeforms have eukaryotic cells and are classified as eukaryotes. 2. What is the nucleoid? B is correct. The nucleoid is found only in prokaryotic cells. This is in contrast to choice C, which refers to the nucleus. The nucleus is only found in eukaryotic cells. Choices A and D refer to ribosomes and mitochondria, respectively. 3. Which of the following is characteristic of prokaryotic cells? D is correct. Choices A-C are all characteristics of prokaryotic cells.